← DIY Board Games compendium! We love doing craft fairs and markets! And the thing we enjoy the most is making props to dress our stall. 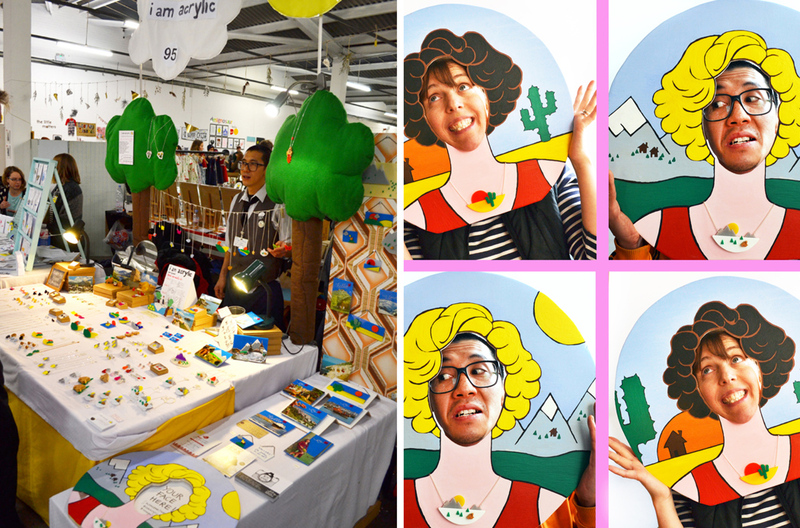 Below you can see our latest stall at the recent Renegade Craft Fair in London, November 2014. We used our trusty trees, that have been with us for a few years now, and we also made a double-sided, hand-held photobooth for this one – lots of fun for our customers and passers by (and us!) and an extra high cloud and sun – made from wire and tissue paper the night before – so we could be seen from afar! The stall we have now is quite different to our first ever market stall in August 2008 at Backyard Market just off Brick Lane. Back then, Brendan was working solo on I Am Acrylic and I was making Owlch! owl-shaped pin cushions, and felt and knitted bags. Even then, although it’s basic, we still thought it was important to have some props as talking points, which also reflected the stuff we were selling. We were both making things behind the stall too to add interest and illustrate first-hand how things were made. The next market we did was up in Stour Space in Hackney Wick in May 2011 – it was just after I’d quit my job and joined Brendan full time on I Am Acrylic… so we were going for it, doing lots of markets! For this one we made a vending machine and sorted out some jewellery boxes too! We started trading regularly in the upstairsy bit of Sunday Upmarket in July 2011 – again just off Brick Lane. The photo above is probably six months after we started trading at Sunday Upmarket. We were still using the vending machine and we added more material to cover the front drop of the stall, we’ve put shoe boxes under the material at the back to add some height. 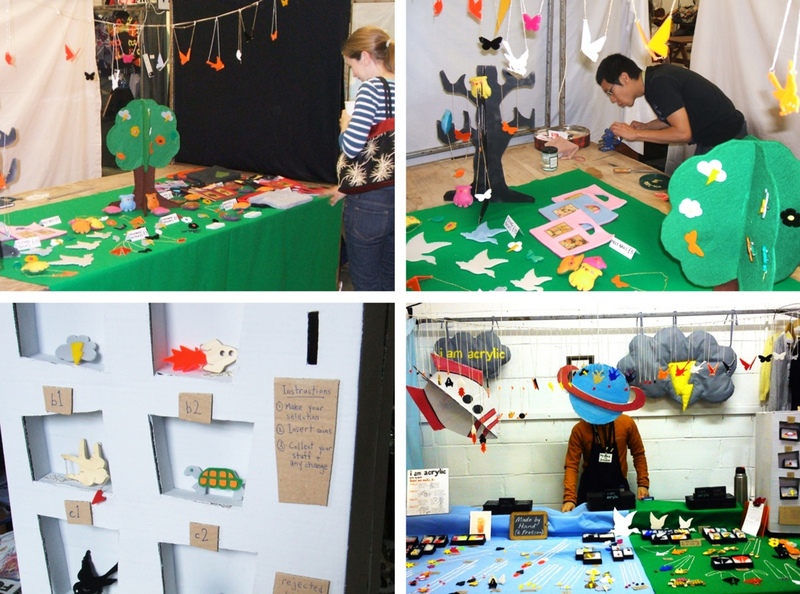 We also made our big felt cloud props and had flying cardboard space things to reflect our range. Also, having a string across the stall with things hanging really helped to make the necklaces more visible – and looks nice! 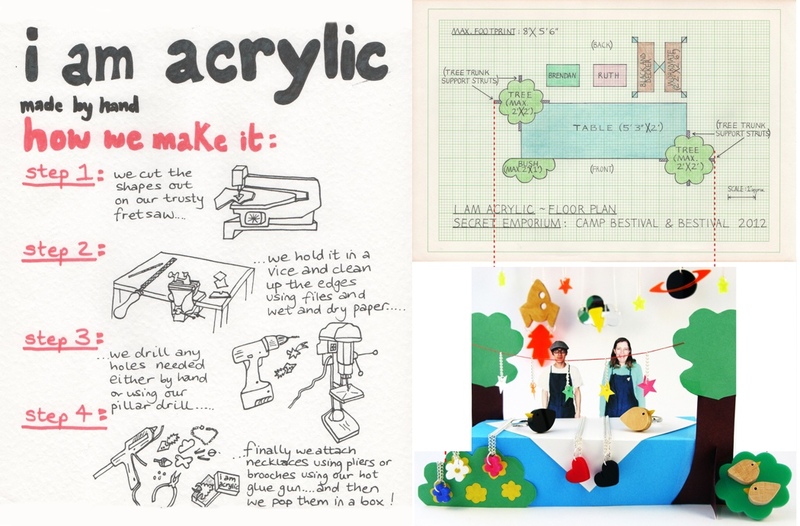 Another addition that has been a staple on our stall for a few years, is the ‘how we make it’ picture/sign (which you can see in action in the main picture at the top of this post). We love how this is a conversation starter and have had some excellent advice from all kinds of professionals who have given us tips on how to make things and where to source materials etc! (Plus it gives slightly bored husbands / girlfriends / boyfriends something to read as their other half browses the stall!) We do need to update it slightly though with our newer designs and add in some super glue instead of the gluegun! In the summer of 2012 we applied for the Secret Emporium market stall tent at Camp Bestival and Bestival. As part of the application you had to outline how you thought your stall would be. This was a great challenge because we had to build a stall from scratch. We decided that we needed to have a table (obviously!) 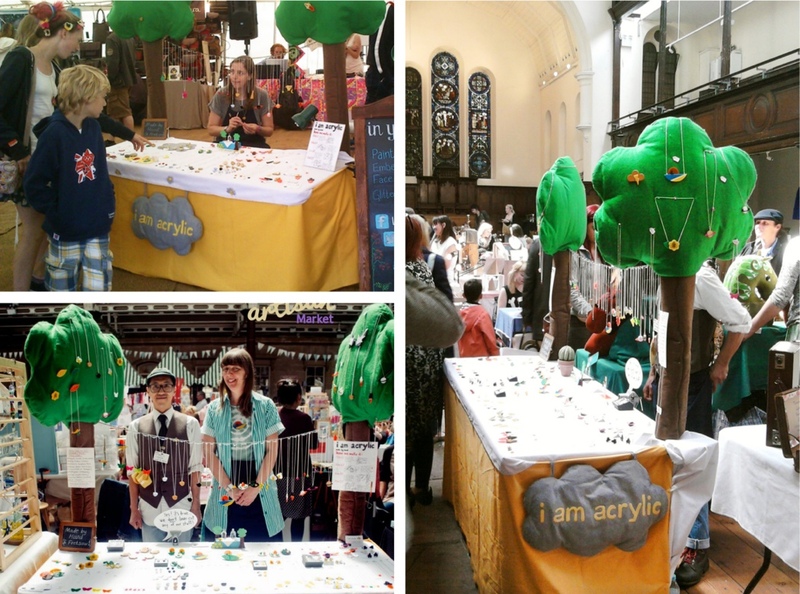 but what we really wanted was a string to hang the necklaces on – so we came up with our trees! The picture above shows our mock-up application (using all of my CDT A-level draftsman skills!). After that we started to display the mini mock-up paper stall on our regular market stall – and it has been well-loved ever since! We’ve toured the trees to other markets too where there is no stall framework to hand a string from. We have also had the challenge of trading using a smaller table at the wonderful Crafty Fox Market that uses pubs and pub tables for the traders. 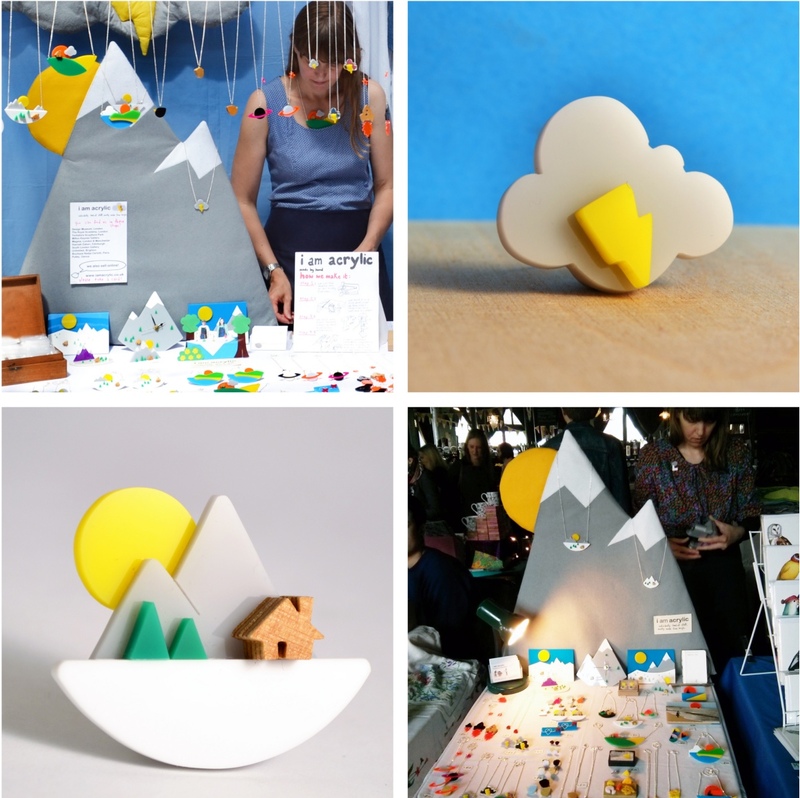 We designed a felt mountain for our Crafty Fox stall in the Dogstar pub in Brixton back in the Spring of this year. Again it’s a prop that reflects our designs as well – so it makes sense and provides a nice vertical backdrop to a smaller stall. We now use it when we regularly share a stall with Rachel from Code Street Clothing at Old Spitalfields Market too. I’m sure we’ll keep on making silly things to go on the stall – we had a tombola a few Christmases ago (that was fun) and the vending machine was a lot of fun too. We might re-visit that idea one of these days! 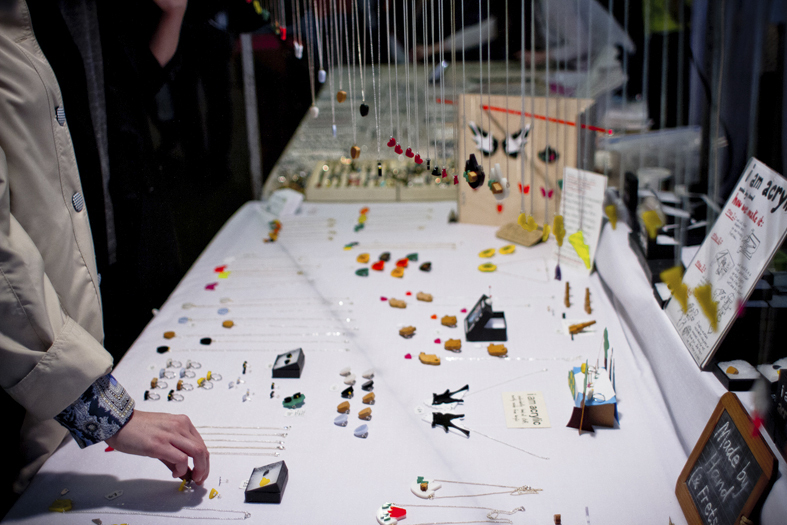 Main image: In the downstairs bit of Sunday Upmarket in April 2013. Photo by Boberika. Thanks also to Bath Artisan Market and Marcus Way for the image. This entry was posted in I Am Acrylic Stuff, Market Stall Stuff and tagged bath artisan market, boberika, brighton craftacular, BUST craftacular, code street clothing, Crafty Fox Market, folksy, folksy blog, marcus way, market stall design. Bookmark the permalink.